Phibul Songkram (also rendered Pibulsonggram or Phibunsongkhram) was the virtual dictator of Thailand from 1938 to 1957. A militarist who dominated the Thai Army, particularly the mechanized sections, he had participated in the coup that overthrew the absolute monarchy in 1932. He admired the Axis and saw the dispute over the Sudetenland in Europe as a model for his own irredentist ambitions towards ethnically Thai regions of French Indochina and Burma that had been taken from Thailand in the 19th century. He also compared the despised Chinese minority in Thailand, who dominated the internal mercantile sector, to the Jews of Germany. However, Phibul could not bring himself to trust the Japanese, whose diplomacy towards Thailand could only be described as clumsy and overbearing. His vacillation between the Axis and Allies led the British Ambassador in Thailand, Sir Josiah Crosby, to call him "the human weather vane." Thais described his foreign policy as "watchful waiting," and he was widely thought to have done what he felt was necessary for the Thai people. Phibul ultimately felt compelled to throw his lot with the Japanese in response to an ultimatum received the day before the attack on Pearl Harbor. His government declared war on the Allies on 25 January 1942. However, he was shuffled aside in August 1944 when it became obvious Japan was going to lose the war. 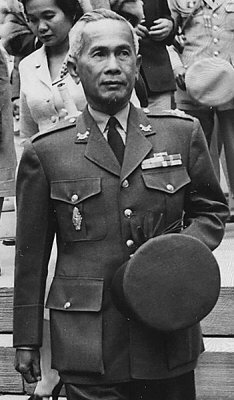 Following the Japanese surrender, Phibul was briefly imprisoned for war crimes (primarily collaboration with the Japanese) but was released under intense public pressure. He overthrew the elected civilian government in November 1947, and his anti-Communism during the height of the Cold War won a measure of American political support. He was thrown out of power in November 1957, ironically after becoming committed to a policy of democracy and free speech following a tour of the United States in 1955. He remained in exile in Japan until his death.